Click on the titles below if you want to see the images featured on Mark Daughtridge’s doors this evening. They sum up some TriTrog alternative facts from 2017. The key to a successful Hancock Cave Bat Count trip is that your team has really accomplished something. The number of cavers had a lot of turnovers since the October TriTrog meeting, but we finished with thirteen cavers choosing a caving trip to Hancock instead of a WVCC banquet the same day. We began the day with Mike Broome preparing a delicious cocoa quinoa porridge to accompany sausage, eggs, peppers, and mushrooms at Tanya’s home. The sticky dark brown porridge warmed us all up before Pete noticed the frozen birdbath outside. We felt sorry for the people who chose to camp instead of getting started with us. I was assigned to Emily Graham’s underground team, along with Natalie Wickencamp and Molly Schlichenmayer. I was told that my job was to be the ladder. When we split away from the other teams, Emily navigated effortlessly through the passages to get us out to the Grantham Room Overlook. I realized that we had a very competent team (sans me). We pulled out the wire brushes to remove graffiti at the south end of the Anastamoses Maze, but we found that creating mud puddles and smearing the mud over the scratched-in names was far more effective. After clearing most of the walls in one junction, we took a break to see the nearby historic 1896 signatures. Then we rubbed more mud on the walls to hide more recent names and arrows that pointed deeper into the cave. Emily revved up the group as she adeptly led us around the MC Escher Loop, and Natalie led me into the tightest crawl off of Harrington Hall. We found a live bat while heading to the Over-Under and then began more graffiti removal from the Over-Under all the way back to the Long Room. However, we left the 1896 signatures from HB Buchanan. I think that the Spring VAR 2018 visitors will really appreciate the graffiti-free look of the cave. After sighting another bat, our group headed for the Funnel Tunnel. It wasn’t flooded but was damper than any time I had seen people pass through before (but there was no rain in the forecast that day). As I lay stuck in the Funnel Tunnel’s tight spot, I noticed that the sticky dark brown mud surrounding my lips reminded me of the morning’s porridge. Drowning in porridge would indeed be a slow death, so I exerted enough energy to free myself and join my companions. We visited Earthworm Gym and Noogah Way in the spare time we had left to explore and then beat a hasty retreat toward the exit. Hasty except for the part where I again crammed my body through the viscous porridge. When we stopped my vehicle at the North Carolina Welcome Center on the way home, Emily went to the back to look for something. We were excited to find that the rear hatch had managed to catch a corner of a Ziploc bag bouncing along the bumper. That Ziploc bag held my spare ignition key. Emily and I weren’t sure that we’d have enough people to have a real cave photography trip; we needed models, people to hold flashes, and sherpas. 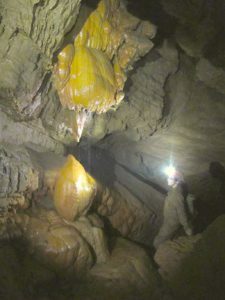 However, we got lucky when Ava, Diana, and Pete agreed to join us for a Sunday caving trip. We drove up to the Bat Ranch Saturday evening so Ava could spend some quality time with a boa constrictor around her neck. I pointed at the trail to the Hillside Entrance to Smokehole Cave, and Pete said “That’s not a trail.” We took a more circuitous route to the cave. Click on the photos below to see the full images. Easy travel corkscrewing down to the stream passage, and then I started looking for places to take photographs. Emily was a good sport as she held the ceiling up while looking down at the stream below her. She seemed okay with her niece being the subject of the photos. When we climbed up the breakdown pile, Emily scouted around while I set up a second photo. Diana couldn’t quite hide from the flash. Pete agreed to pose near a rock whose bottom had eroded away, and then I flipped direction to try a backlit shot of Emily posing on a rock in the stream. Diana’s lighting skills helped us backlight more stream shots, but the main stream split three ways not too much further in. I tried to photograph Diana and Pete walking down a mud passage that led to the Big Room. The Big Room was really big. And muddy. And a good place for a lunch break. Emily looked to be nine feet tall standing over a rimstone pool, while Ava skulked in the shadows. We then exited the cave uneventfully and drove home late Sunday evening. One Thousand Feet For Everyone! 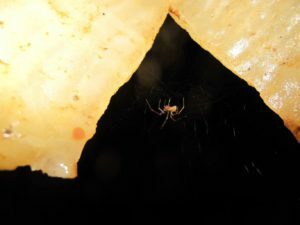 Just got back from Perkins cave today. My elbows and knees are a bit sore but having spent 14 hours underground yesterday I’m feeling pretty good. We got a lot accomplished. The trip consisted of three excellent teams who each surveyed over 1000’. In total we logged over 3200’ for the trip. Official numbers will come later after Jason gets the data in the computer. 4pm – Sent out a late note to Jason confirming I was joining his trip. Still needed a place to sleep. Also, I had nothing packed and was still at work. ~6pm – Got off the phone with Bill Grose who even though he wasn’t caving, offered me a bed in his house for the night! 10:40pm – After braving the grocery store, and then later I some very heavy rain near Mt. Airy, NC, I landed at Bill’s place. 7am – Woke up for the day. Before I could leave, Bill spoiled me by making sausage and eggs. Much better than the food I had planned. Yum! 8:30am+ – Met up with the team in Meadowview, VA before caravanning to the cave property. 10:40am – I was the last to enter the cave. I think the longer I’ve been doing this, the longer it takes me to get ready. 10:45am – Met everyone else who was already in the register room checking instruments on a survey course Jason had setup to make sure there were no issues with anyone’s equipment. 1:? ?pm – We arrived on the other side of the 800’ crawl. From here we Jason and Steve went their own way while I led the others to leads Steve and I generated earlier this year. My team started by resurveying a shot I took issue with at the end of our last trip while Amy and Nick went off into passage where the flagging hanging in the walking passage was moving in the breeze. Our passage was not quite as expected. Although it began looking great, we quickly seemed to reach the end of our lead. This didn’t make a lot of sense considering the old map seemed to show a very long passage in the direction we were headed. Around this time Elliot dropped his glove down a small hole and couldn’t get it back. This motivated him to downclimb a hole originally perceived as something we’d rather try to bypass. Turns out the drop was not only the way to the glove, but also the best way forward. The bottom of the drop immediately produced three leads. Since we had a DistoX with us I was motivated to do the awkward shots first. After four shots, we decided we didn’t want to push that lead further as we found ourselves chimneying in less than stellar passage. Back to our other leads. Having poked my head in both directions I suggested we take the worse looking lead, saving the nice lead for something we could look forward to later. We never got back to that lead. Survey where went started off crawly, but eventually opened into nice straight canyon passage. Just before reaching the steam we encountered an area we’ve come to call the “Juice Bar”. At the time Elliot was on point and he started giggling to himself after discovering it. Janet thought he was being weird until she met up with him and discovered what the fun was all about. There is a layer of “rock” in this area that we saturated such that it would ooze out water when pressed. We all agreed it was pretty neat. We left one lead near the Juice Bar going downstream then continued upstream for some distance. We reached a point where two streams converge and we continued the tradition of starting into the less appealing passage. We stopped where it looked like we would get wet. Elliot checked the lead and reported it opens back into walking passage after 15’. He got his hands and lower legs wet going in, and not wanting to get wet myself I opted for the other stream lead. It started great with a lot of water and a pretty 4’ waterfall below us, but eventually we ended up in passage frequently narrower than my shoulders, but it was at least tall enough to stand. As a sketcher, it was especially annoying because the floor the stream meandered along was typically about 10’ wide but only 1-2’ high. Finally, things in front of me started sounding better when Elliot reported pretties, but unstable looking breakdown. I ran ahead to join him to see if things were as fragile as he claimed. I climbed though with no issue and suddenly realized I was in known passage. Jason, Amy, and Janet had surveyed down to this level on the last trip. I started yelling with excitement about the loop closure we just managed. To add to it, I knew Jason and Steve were expected to return right over our heads before leaving, and before I could catch up with the sketching, they had descended to our level to fill bottles before leaving. 11pm – Everyone meet at the planned location and time just before the 800’ crawl. We snacked and chatted a bit before heading for the exit. After everyone was situated, we totaled our numbers and excitedly reflected on how productive we all had managed to be. It’s quite rare for every team on a cave survey trip to be so productive. Steve and Jason left for home that night while the rest of us camped on the property. We exited for home the next day before the morning haze had fully cleared off the mountain. Perkins cave makes me happy. 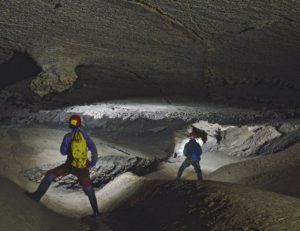 Carlin and Dave cancelled a planned cave trip with an aim to drag heavy scaling poles through a water-filled belly crawl. Phew. Eric Williams, Emily Graham, Tanya McLaughlin, and I opted for an easier trip on a sunny June Saturday. Eric prepared a great breakfast for us, yet we still feasted on the cherries in Tanya’s front yard. So sweet and delicious. Eric’s five-year-old daughter couldn’t get enough of them. We started with a short trip to Stone’s Cave No. 1, at my request. The guys mowing the field thought us a bit strangely dressed until we told them about the cave in the woods. I had to collect a profile sketch and check some leads before I could draw the map. I got very focused on completing my mission and determined that the leads were definitely dead ends/too tight for me. 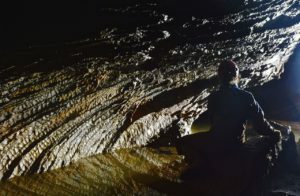 When I muddily returned returned from the upstream dead end to the group, I found Eric’s daughter crawling on a high ledge to avoid a deep pool (that had been empty on previous trips to the cave). This seemed unnecessary because she was already soaked from a previous pool. However, the surprising part was that a dog had followed the group into the cave. The untagged dog (later dubbed Happy Happy by the five-year-old) found travel through the cave particularly easy, but Tanya and Emily didn’t like getting soaked when Happy shook the cave water from his coat. We then travelled to Speedwell Cave because none of us had ever been inside. We explored a few different levels, and I discovered that the five-year-old had a considerable advantage in the two-foot-high passageways. Some pretty formations but some graffiti. We were delighted to find little to no garbage dropped inside this oft-visited cave. When someone mentions they will be passing their Saturday by crawling through miles of narrow, underground passageways accompanied by quasi-strangers, the response is clear: me too! Answer as such and you find yourself in a minivan packed with fellow cavers, pouring over maps detailing a large network of below-grade paths with varying ceiling heights. Mark had graciously agreed to lead Alice, Jim, Ester, Andy, and me through Paxton’s cave, teaching a subset of us the basics of caving along the way. At this point I still (rather naively) believed both the map, that claimed that the lowest ceiling height would be a spacious 3 feet, and Mark, who asserted the only crawl would be a 10-foot stretch at the entrance. And here I was hoping to at least get a little muddy. 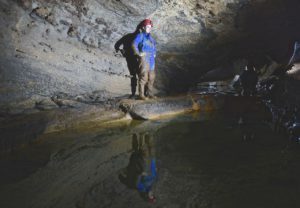 After catching some sleep in a hotel adorned with a fist-sized hole in the wall and filling up the energy reserves with some solid meals, we were suiting up at Paxton’s ready to venture behind the waterfall and into the cave. Once Paxton’s dog, Boomer, fully ‘christened’ Rob’s pack, and Alice finished the last touches on her impromptu belt made from duct tape, we were ready to go. Watching people disappear under a rock in front of you is not only exhilarating, but you know you are surrounded by like-minded adventurers when their first instinct is to follow suit. True to Mark’s promise, the first low section to reach the larger passage was indeed a fun crawl, and I was instantly hooked on caving. Entering a few larger rooms, we found the first of many soda straws and helictites. You can’t help but be awed by the sight, especially considering the time needed for such beautiful formations to occur. Each room had many offshoots, and I was glad to be led someone who knew the way. Mark diligently bestowed the caver tenets: don’t trust the arrows or the elephant tracks, watch your head, and touch as little as possible, except for 3 points of contact. 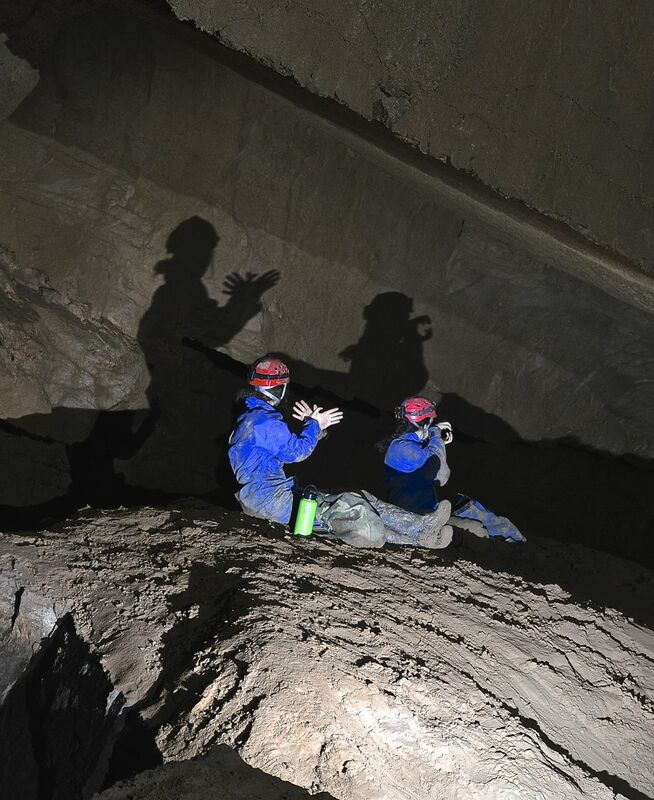 How reassuring to know these are no spelunkers, but instead responsible cavers. It was not long before we reached the incredible expanse of the Anthrodite Room, our throne room with Esther and Jim settled in as our king and queen. After lunch, the adventuring continued. Our first surprise was some traces of cave wildlife. Wild, indeed, despite being inanimate. Some ambitious souls had trucked a few surprising items. Now, the Neanderthals of 50,000 years ago would have expressed their artistic side with cave drawings. Today’s humanity? Barbies, and a well-endowed Ken in compromising positions, watched by a power ranger and some dinosaurs. (….I’ll let you decide whether we have reached the apex of evolution yet.) Not long after we happened upon the elephant rock, (or horse, or ‘rock machine’, depending on who you asked), and we branched out from there to do some exploring, complete with some narrow squeezes. 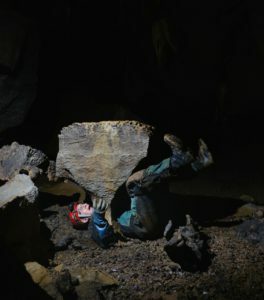 The most notable being one we had encountered earlier, dubbed the superman rock, given that in order to traverse this narrow crack, your body had to contort into flying-superman cave dive, at an awkward angle. This was followed later by a large tombstone rock, also a narrow squeeze. Mark, with an eye on the time, suggested we travel back through the maze in order to trek in the general direction of the entrance. With three experienced cavers as part of the group, we were fortunate to have three compasses to consult to find north. Only… Mark pointed one way, Rob another, and Andy another. Hmm. It was about this time I thought it prudent to ask if Mark had ever gotten lost in this cave, and his answer was not reassuring (Hint: it wasn’t no). Interestingly, the more times we happened upon the same exact tombstone as before, the more we slowly transitioned to looking for survey tape, arrows, and elephant tracks. 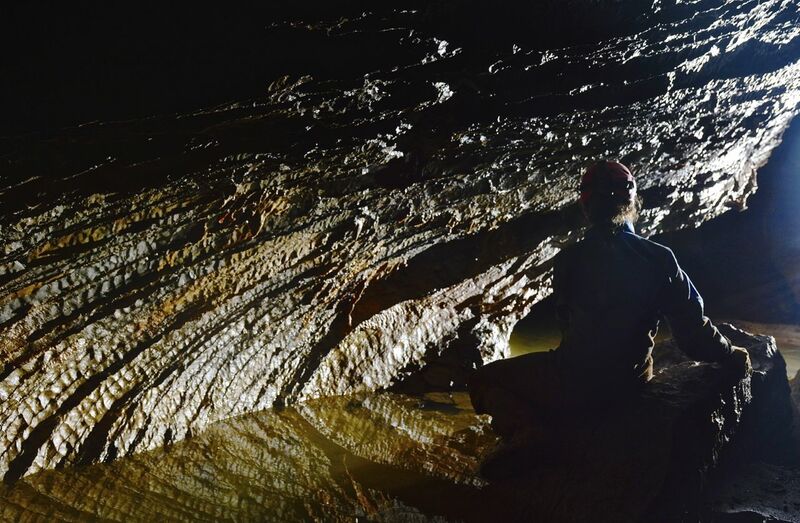 It was about this time that ‘scouting trips’ became the norm, and during one time Mark ventured ahead to see what rooms he could uncover, we all extinguished our headlamps and laid back on the cool rock to let darkness envelope us. Having already covered the deeper icebreaker cave conversations of cow puns, death, God, and jokes about a small medium at large, we could sit back and enjoy the all-encompassing darkness. Mark reappeared with a route in mind, and if we followed enough of these said ways out, eventually one of them might not circle us back to a rock we had seen an hour prior. We started attempting some more challenging climbs, and some even tighter crawls (remember the 3-foot ceiling promise? ), and this led us to the promising sign of leaves scattered at the bottom of the break down rooms. It was with true disappointment that I finally heard the waterfall at the entrance, knowing that meant I wouldn’t get to spend the night in the throne room. 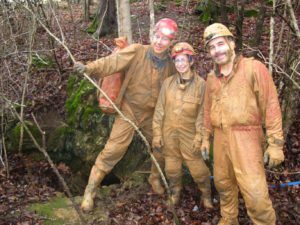 Donned in mud from helmet to caving boots, our group emerged as a new round of cavers that had thoroughly enjoyed all the underworld had to offer. 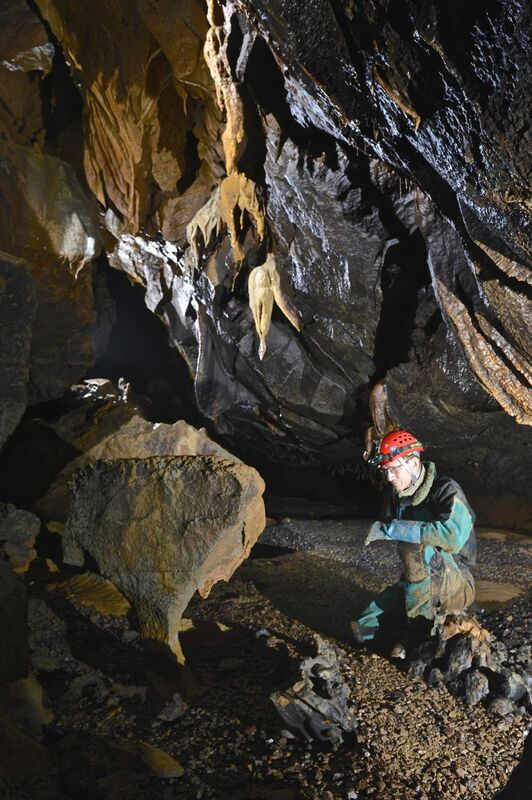 Was Paxton’s an excellent introduction to caving and the start to a new realm of adventure? To answer in Troglodyte fashion (per Andy’s suggestion): Good cave! You’ve probably gotten the April issue of the NSS News by now. I’m pleased to say that Dave, Carlin, Mark, Brian Williams, and I had the opportunity to cave with the cover girl, Steph Petri, last Saturday. 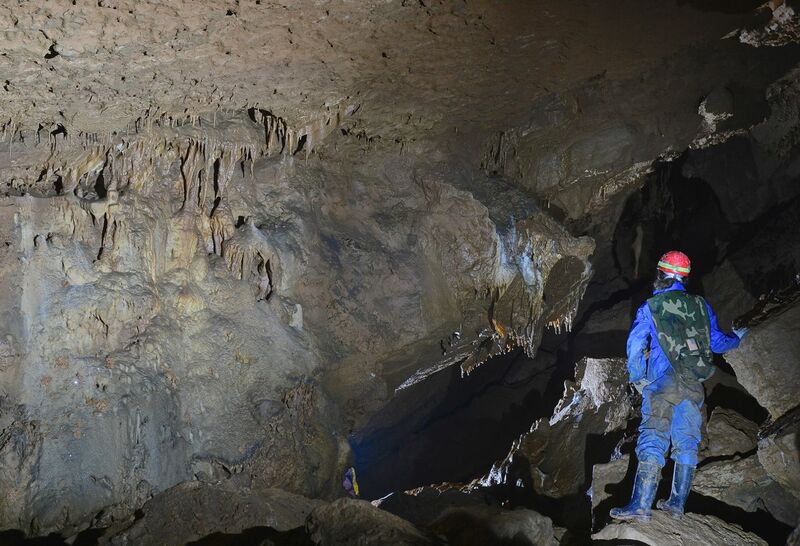 Dave and Carlin led us back to the VERY wet part of SnoCone Cave to continue the survey. Steph, Brian, and Carlin were assigned to the stream belly crawl while Mark, Dave, and I sloshed on through. We began surveying into a small but well decorated room that poured white formations from forty feet above. Mark and Dave surveyed down a crack where I couldn’t fit then returned to help survey through. Although things got complicated when Carlin’s group caught up with us, we continued surveying along the stream level while the other group headed up to survey a well-decorated room above. Mark and I plugged along across rimstone pools and into another high echoing dome. Fortunately the stream led us out of the narrow crawlways and into a massive foggy chamber. The fog was generated from a fifteen-foot high waterfall that cascaded down into our room within a tomb. Ancient faces peered from one wall, and a massive stalagmite pyramid spilled twenty feet across the room. My favorite decorations appeared as a series of rose buds perched on a flowstone slope. Without scaling poles we couldn’t proceed further with the survey that day. Mark, Dave, and I took a short trip up to the well-decorated room discovered by Steph and Carlin. On Sunday we headed to Dutton’s Cave on the other side of the county. I crossed the field, easily found the entrance, then returned for the others and a cable ladder. The sport trip had me leading Mark and Carlin down one of the three pits just inside the entrance while Dave and Tanya waited at the entrance. We found an interconnected maze that drained down to a single pool thirty-seven feet below the upper entrance. 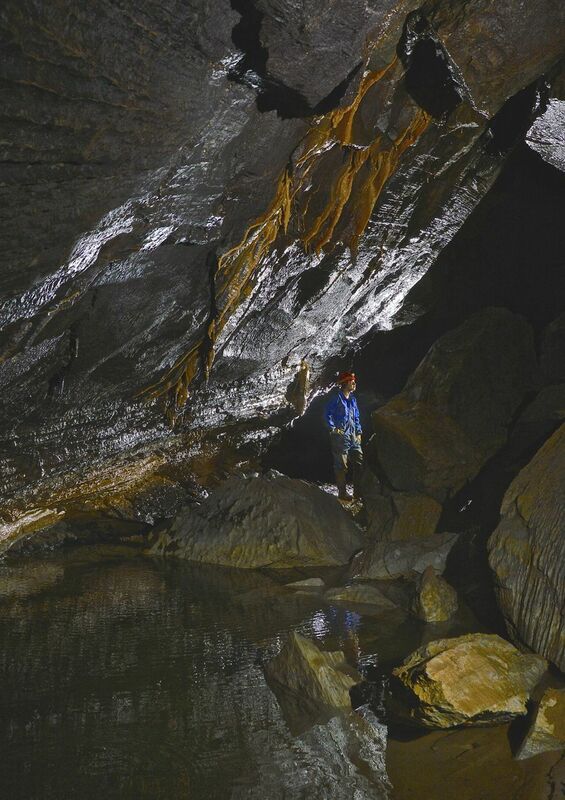 Before leaving, Carlin and Mark ducked into Radon Cave to understand that the entrance fill is very easy to clear. Nick, Eric, and Bill from Walker Mountain Grotto joined Eric, Emily, Pete, and me for a bat count/graffiti cleanup trip in Hancock Cave on February 19. The cave is owned by the West Virginia Cave Conservancy and a sporting cave for cavers. Emily led us through much of the cave, Bill discovered a tusk/rib bone in the mud, Pete led Eric and Nick up the steep climb to the High Route, the Erics, Emily, and Nick wiggled into the Comic Book Hole, we counted a limited number of bats and found the Funnel Tunnel full of water, and I rubbed out directional arrows from spray paint and other anthropogenic origins. Winter forecasts for the mountains are traditionally subject to change each hour. Therefore, I tried to plan a trip with multiple possible objectives, ready for the weather to keep us guessing. Bring along the cable ladder, multiple sets of survey gear, lots of webbing, extra books, but leave the raft at home. Pete Hertl, Emily Graham, Mark Daughtridge, and I started the day in the drier cave at the top of the Smyth County hill, Cassell’s Cave. We began surveying up a muddy climb into the Truffle Passage, where Mark sniffed out the places to set survey stations. We quickly rose to a peak and then descended into the passage beyond. Down a long slope to the edge of a pit. Mark descended the 24-foot deep pit, and then Pete set off to retrieve the cable ladder. I had left the cable ladder just 100 feet back, but Pete’s voice disappeared. I sent Emily to the top of the slope to contact him. I heard her calling several times. Pete had retraced his steps all the way back to the entrance; they eventually retrieved the cable ladder while I kept Mark company while he sat at the bottom of the pit. Mark announced that the cave seemed to continue in two directions at the bottom of the pit, but both directions looked tight. After Pete, Emily, and I descended the cable ladder set in a dripping waterfall, we were less impressed by the leads. Mark pushed his body into one lead and kept snorting and shoving, but I don’t think his feet ever left the room where we stood. Emily chose to survey the opposite lead and gleefully wallowed beneath an archway. Pete and I surveyed toward her, and then we sent Mark wallowing after her. The tiny archways (one foot high by one foot wide) petered out, and I could barely peer through the mousehole where Emily had crawled. After that adventure Emily just slipped right into the lead that had befuddled Mark. 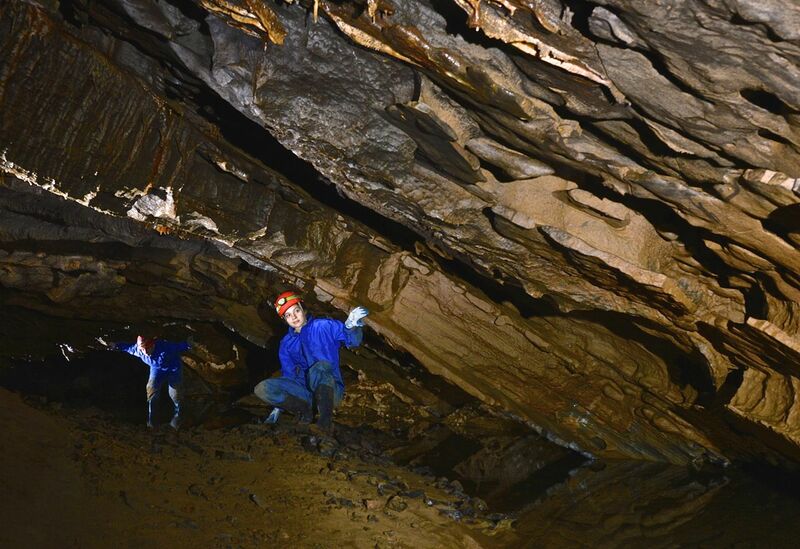 That side deadended quickly too, so the Cassell’s Cave survey is complete after we added 190 more feet. 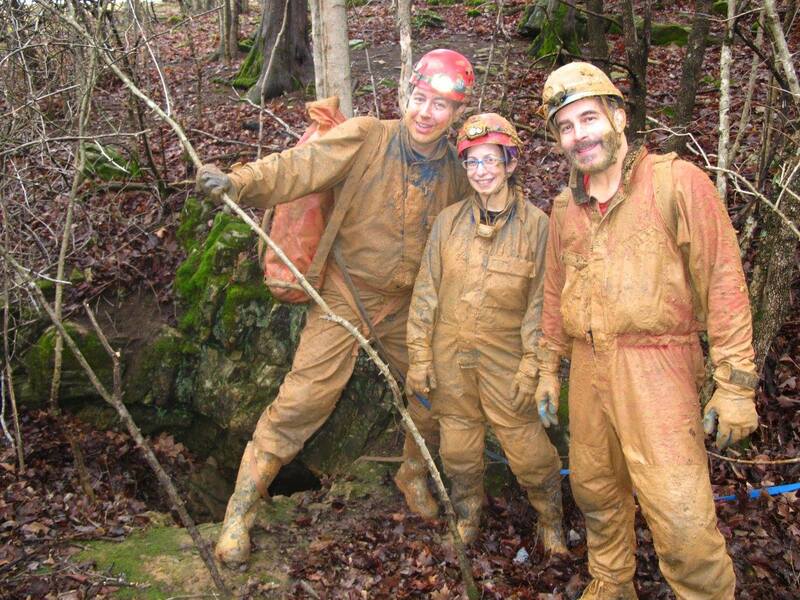 We were all muddy messes when we exited the cave. Pete was feeling lucky with his camera, so we headed down the hill to Stone’s #1 Cave. I was amazed that the insurgence was almost completely dry. Pete photographed the golden Aztec writings and the orange Hot Air Balloon formation, and we headed home that evening after a dinner with Tanya McLaughlin, our gracious host who found these caves for us.